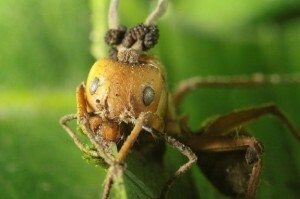 The Ophiocordyceps unilateralis fungus infects carpenter ants and then somehow makes the ant move to a leaf at a specific height (out of the ant’s normal habitat). The ant will then clamp on to the underside of the leaf and will then die. The fungus then erupts a long stalk out of the ant’s head. This then sprinkles spores that can infect more ants and the cycle starts again. One last interesting fact: The human body carries around 10 times more bacteria cells than our own body cells. However, the bacteria cells are much smaller than our own cells. Without these bacteria, we would be in big trouble. This entry was posted in science and tagged biology, science. Bookmark the permalink. My blog is about Beach wedding.